I'm a writer of contemporary women's fiction and romance. I enjoy writing thoughtful, honest stories about ordinary people, family life, and the complexities of modern relationships. Realistic incursions into life as it is, I suppose: stars don't always align and life throws you a curve. But then there are all those moments that make life a wonderful journey too. So sometimes you may find yourself relating to the many struggles some of us face in our daily lives, at other times, cracking a good laugh. Or swooning over one of the heroes. My story? After spending half of my life studying literature and writing about books, it wasn't until recently I'd try my hand at crafting stories myself. It turns out I fell in love with it, and now I spend most of my free time thinking of ways to challenge my characters. By day, I'm a professor of intercultural communication. I live in sunny Southern Europe with my husband, my extraordinary twins and two frisky rescue dogs. While I'm Gone: A Novel by Ana Simons is a women’s read and a romance novel. While I'm Gone is a story about Sophie, a woman who thinks she has everything that she is supposed to have at that age, which means a career, a husband, children, and family. That’s why it comes as a shock to confront the reality of her marriage and to find out that the relationship is not what it seems. In the midst of this, as she is traveling for work, she happens to meet Matt, a successful doctor from Boston. A chance meeting at the airport turns into more and more meetings after that since Matt becomes interested in her. Sophie goes with the flow and finds herself attracted to the handsome doctor. This is the story of how Sophie navigates this phase of her life and if she can trust herself to make the right judgements and right decisions for herself. 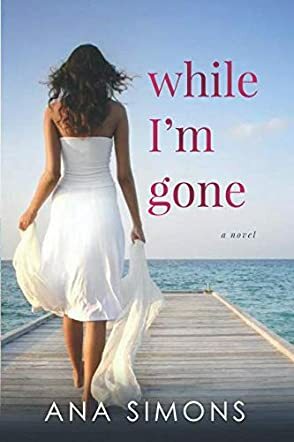 While I'm Gone: A Novel is an engrossing read and although the story is Sophie’s story, it is also a love story and offers a readers a look at unexpected romance and second chances. The story is mostly told from the perspective of Sophie herself, which allows us a glimpse into her own thoughts and emotions. The initial interactions between her and Matt are fun and have all the marks of a new romance. Both of these characters are portrayed somewhat realistically, and it is easy to empathize with either one of them. Overall, the fast-paced narrative and engaging story line make this a fun read.